And what a lovely day it was too. Many, many thanks to everyone who helped to make it for us. First up, I know the monthly garden shots are overdue, but I've been knitting too much to type it all up! Instead of which, a quick knitting update. It is progressing well, but it's still touch and go whether it'll be done on time! 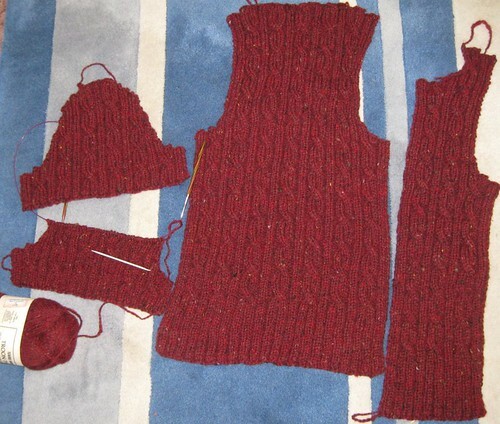 I've finished the back, left front, one sleeve and a good chunk of the second sleeve. Still to go is the other sleeve, the right front, the big collar and the button band. I did find the buttons I want yesterday, but I forgot to put them in the progress photo. Please excuse the gormless expression! 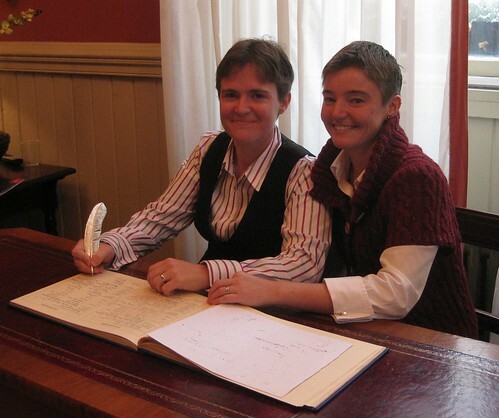 I don't think I've mentioned it yet, but my Gorgeous Girlfriend and I are having a civil partnership ceremony thing in a couple of weeks. We're taking it seriously, but not really going big on it. Lots of people seem to think we're being a bit casual about the whole thing in fact, but we don't really want a big fuss. So it's going to be a really small ceremony, followed by a spot of lunch, with a party in the evening. So anyway, my Mum told me we have to have some nice clothes, and sent cash just to make sure. We toddled off into Brighton on Saturday, to see what we could see. Nada. Nothing I even wanted to try on. I did find an almost nice knitted top though. It was too long, in the wrong colour and had some unnecessary pockets that were spoiling it, but other than that it had potential. Nice cables, lovely big collar, short sleeves - smart without being overkill. It just so happens that thanks to doing a totally uncharacteristic exchange with Knitty Fred after he randomly contacted me on Ravelry, I have some cranberry Troon Tweed wool that would be just the right colour and texture for what I was after. But even with much searching on Ravelry I couldn't find the right pattern, so I'll have to make that up. 2 weeks. Well, less actually. The Troon Tweed comes oiled, so it really needs to be washed and blocked and dried before I can wear it. No pattern, and no time to correct if my pattern goes wrong. I'm 30cm into the back. Here goes!